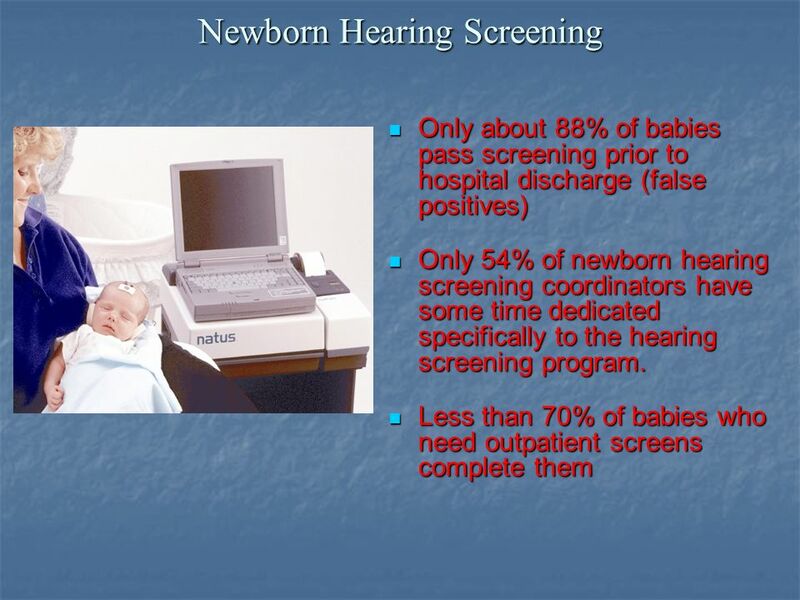 Barriers to Follow-up in Newborn Hearing Screening Programs National Center for Hearing Assessment & Management National Center for Hearing Assessment. 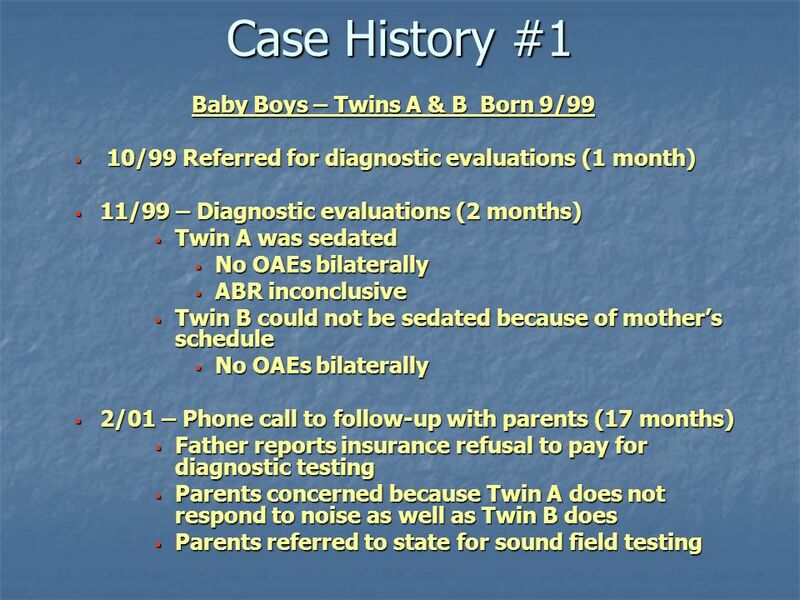 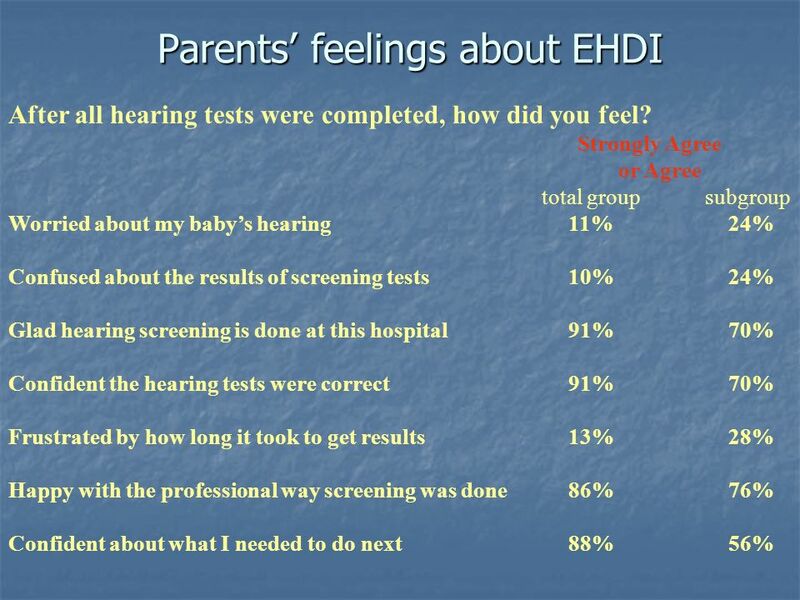 14 Complete Diagnostic Evaluations by 3 Months of Age 21% of physicians think that definitive hearing tests cant be done until a baby is 3 or more months old. 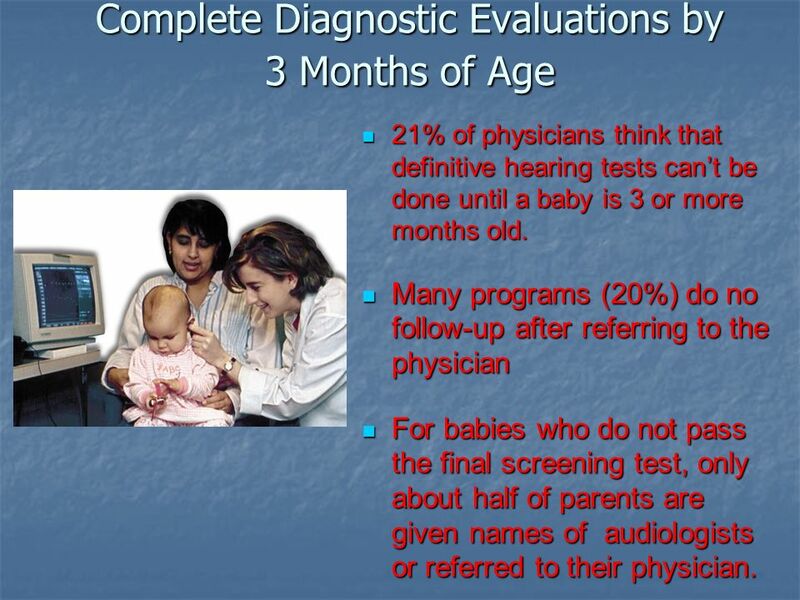 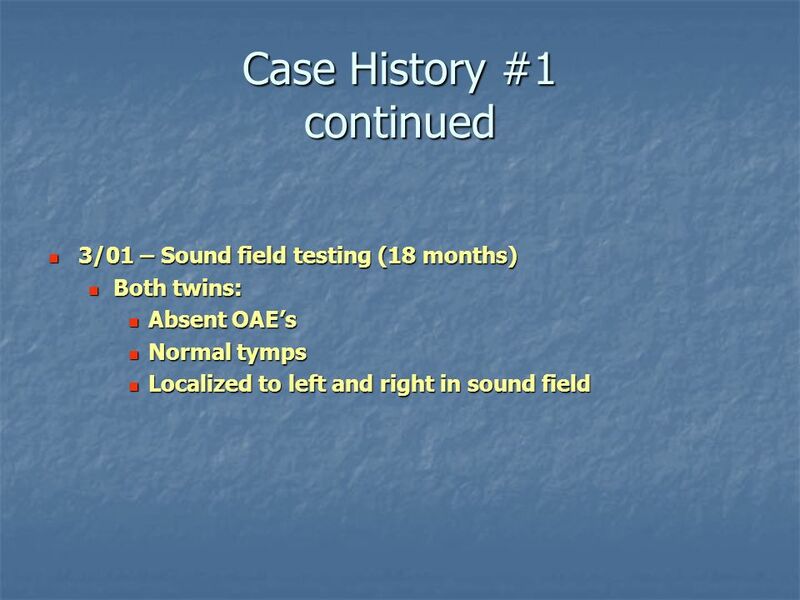 21% of physicians think that definitive hearing tests cant be done until a baby is 3 or more months old. 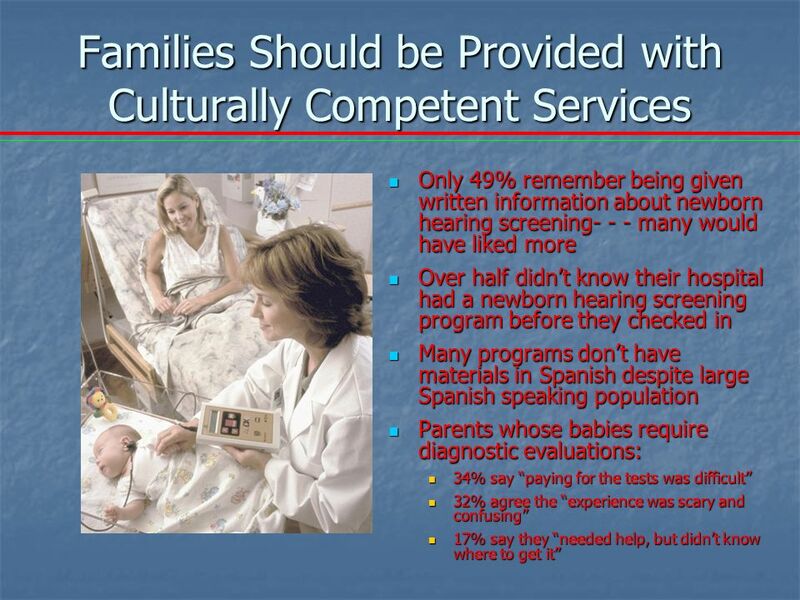 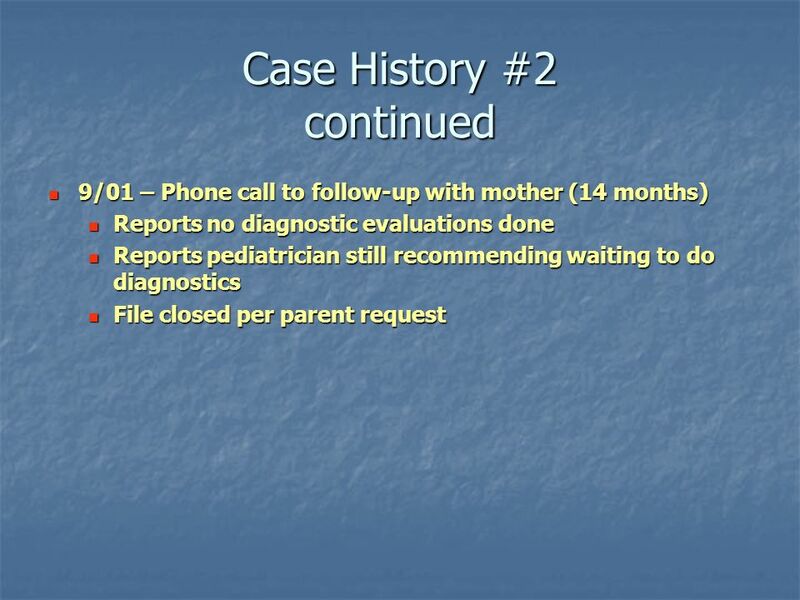 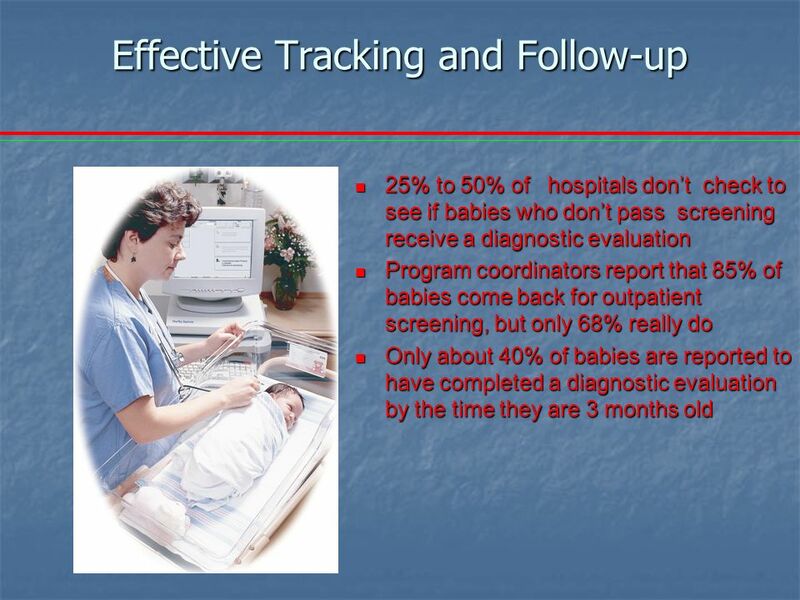 Many programs (20%) do no follow-up after referring to the physician Many programs (20%) do no follow-up after referring to the physician For babies who do not pass the final screening test, only about half of parents are given names of audiologists or referred to their physician. 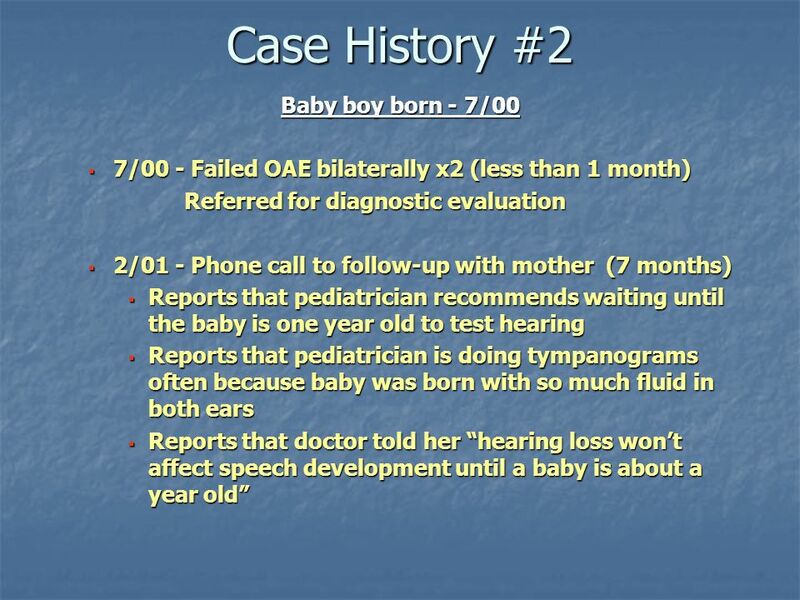 For babies who do not pass the final screening test, only about half of parents are given names of audiologists or referred to their physician. 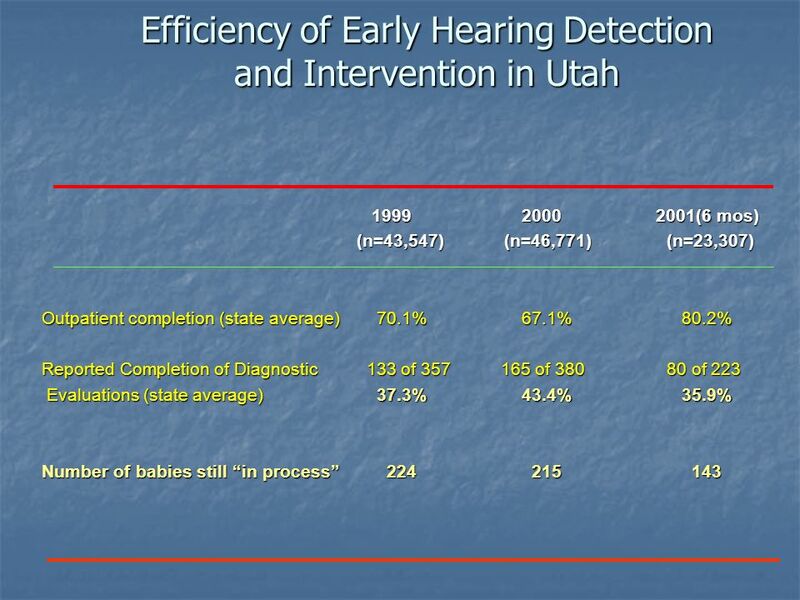 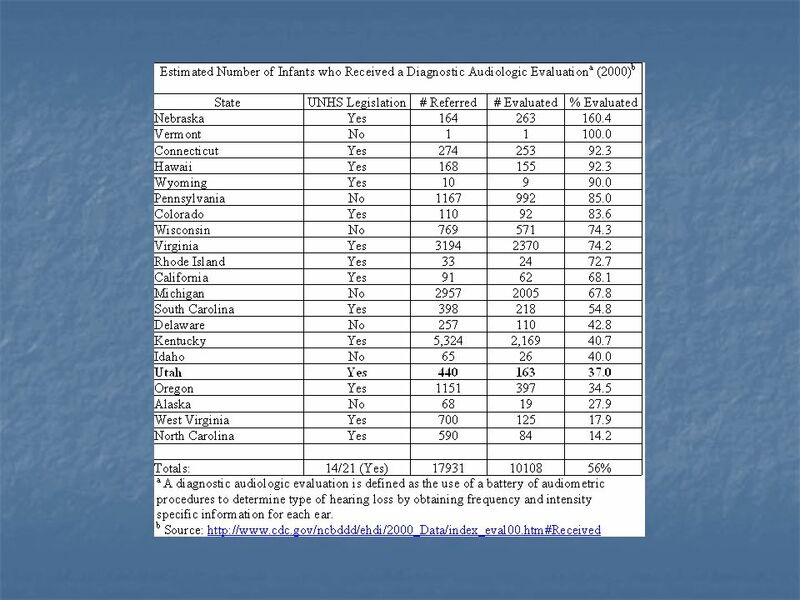 27 Efficiency of Early Hearing Detection and Intervention in Utah 2000 2002 2000 2002 (n=46,771) (n=48,897) (n=46,771) (n=48,897) Inpatient Pass Rates (state average) 86%86% 10 most effective hospitals 93%96% 10 least effective hospitals 63%75% Outpatient completion (state average) 67%77% 10 most effective hospitals 96%95% 10 least effective hospitals 53%58% On average, 134 babies are born in Utah hospitals each day. 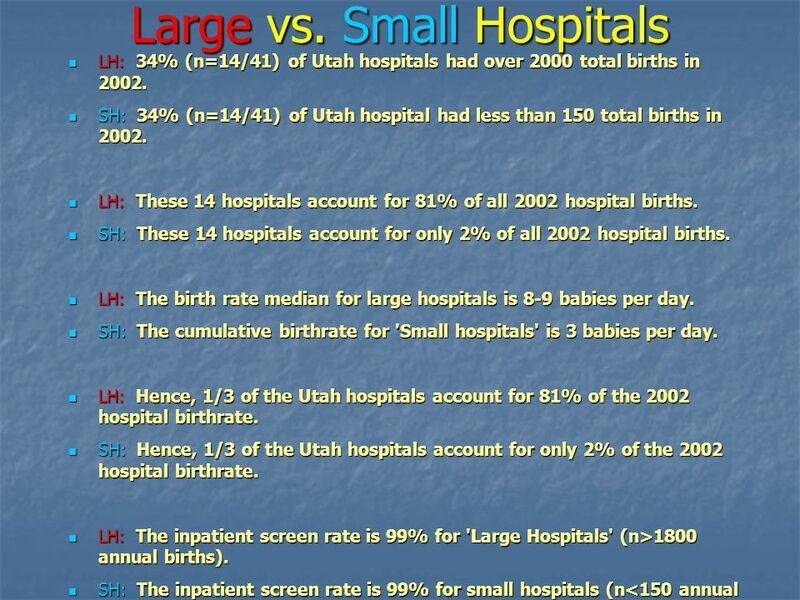 The inpatient screen rate is 99% for all Utah hospitals (n=48,897). 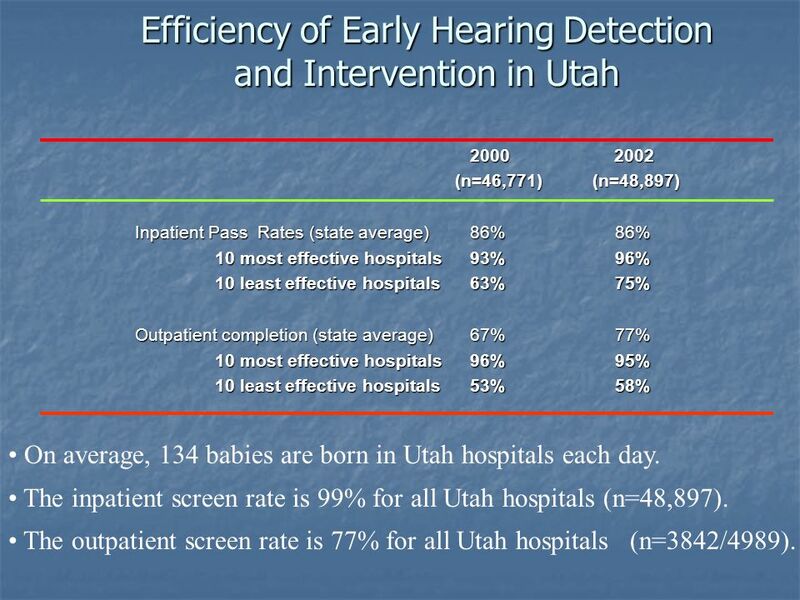 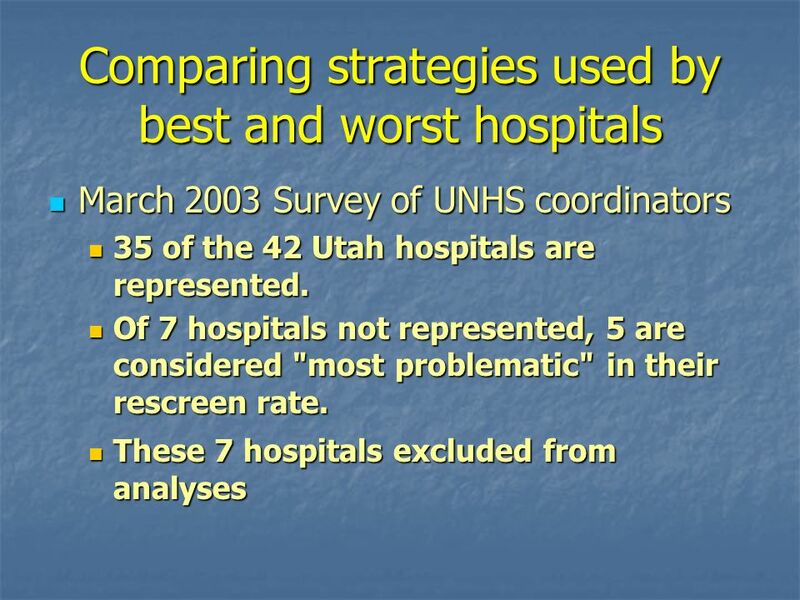 The outpatient screen rate is 77% for all Utah hospitals (n=3842/4989). 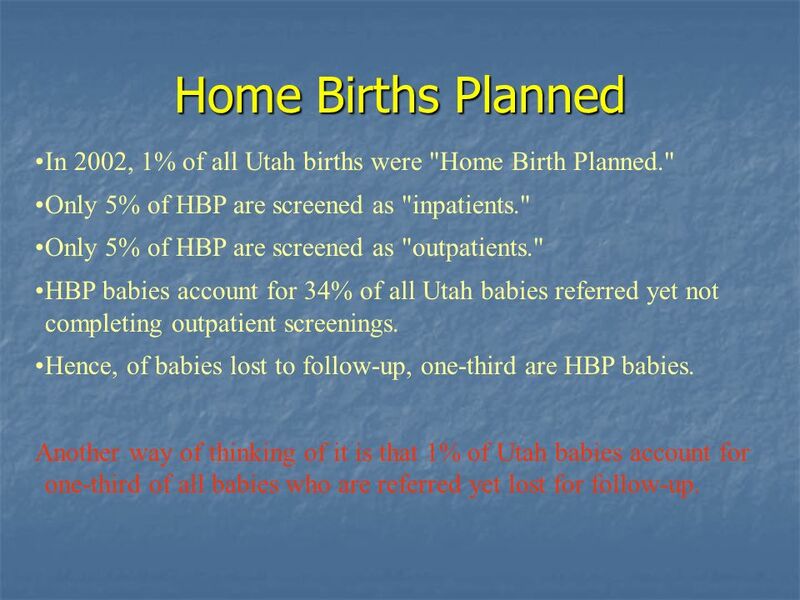 29 Home Births Planned In 2002, 1% of all Utah births were "Home Birth Planned." 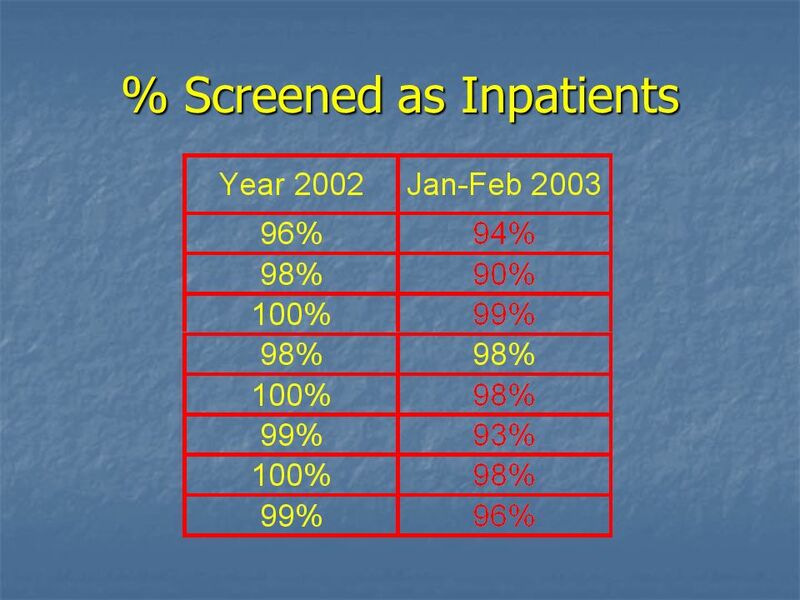 Only 5% of HBP are screened as "inpatients." 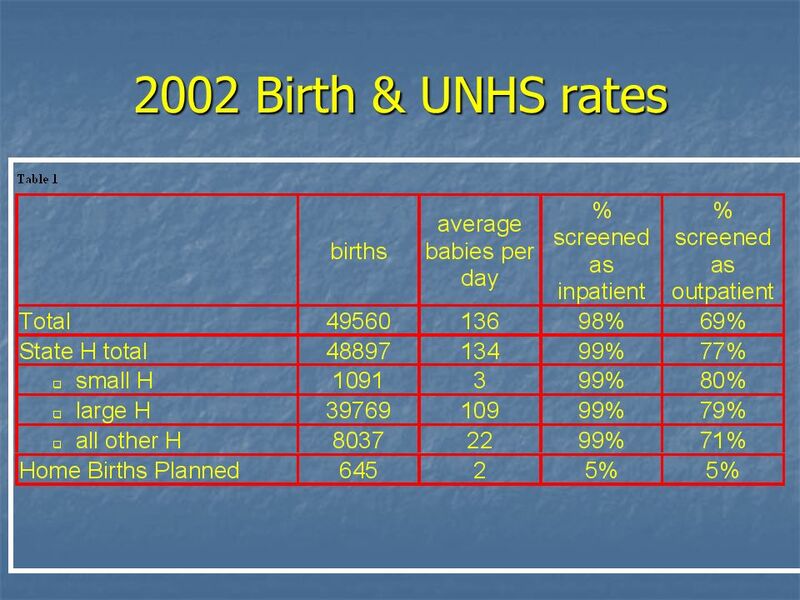 Only 5% of HBP are screened as "outpatients." 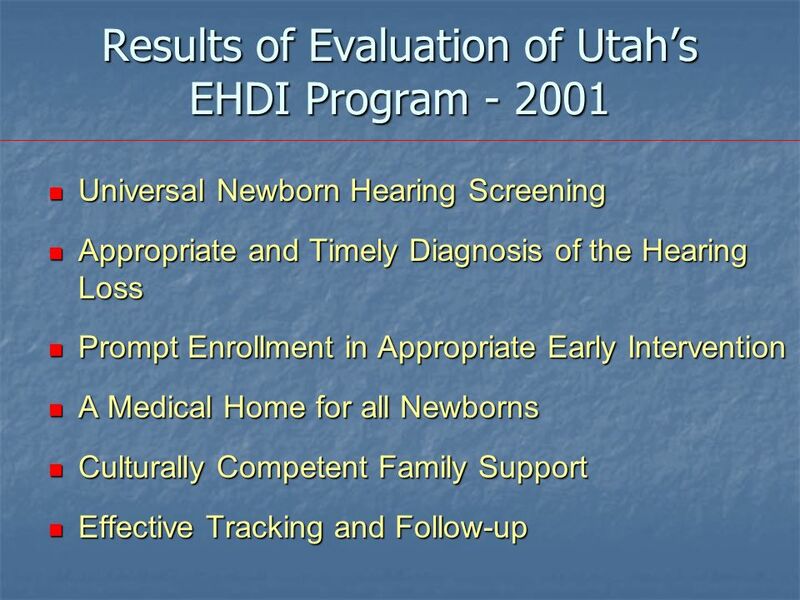 HBP babies account for 34% of all Utah babies referred yet not completing outpatient screenings. 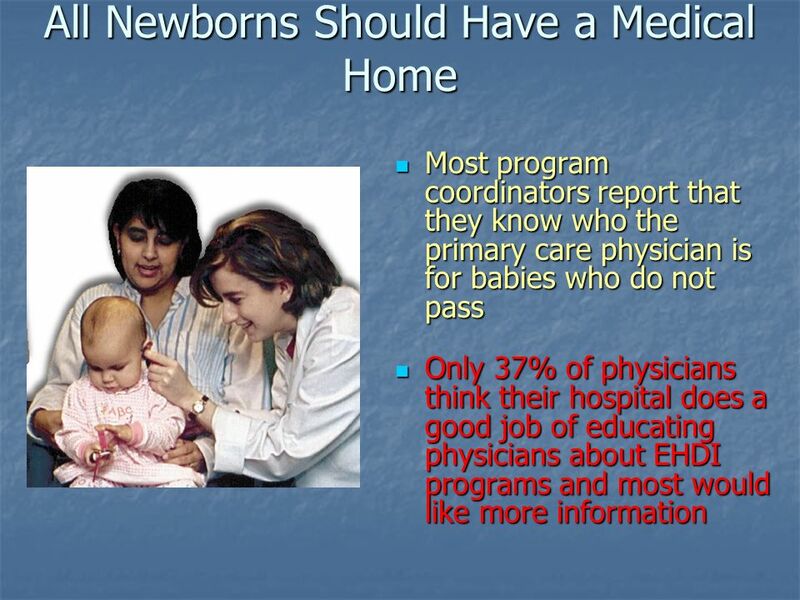 Hence, of babies lost to follow-up, one-third are HBP babies. 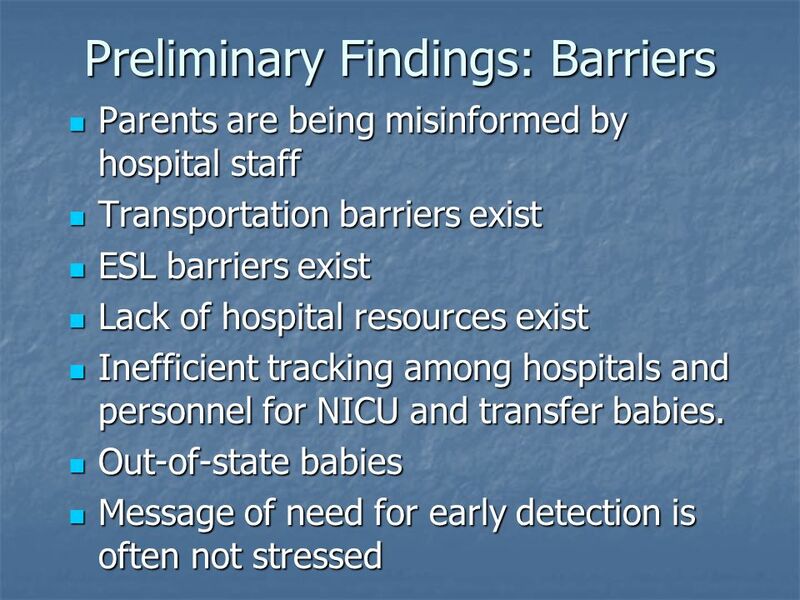 Another way of thinking of it is that 1% of Utah babies account for one-third of all babies who are referred yet lost for follow-up. 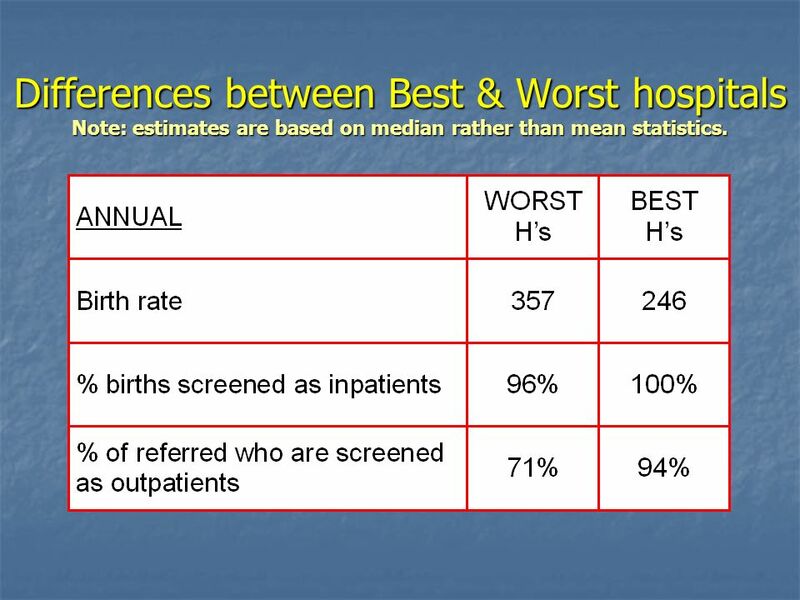 32 Differences between Best & Worst hospitals Note: estimates are based on median rather than mean statistics. 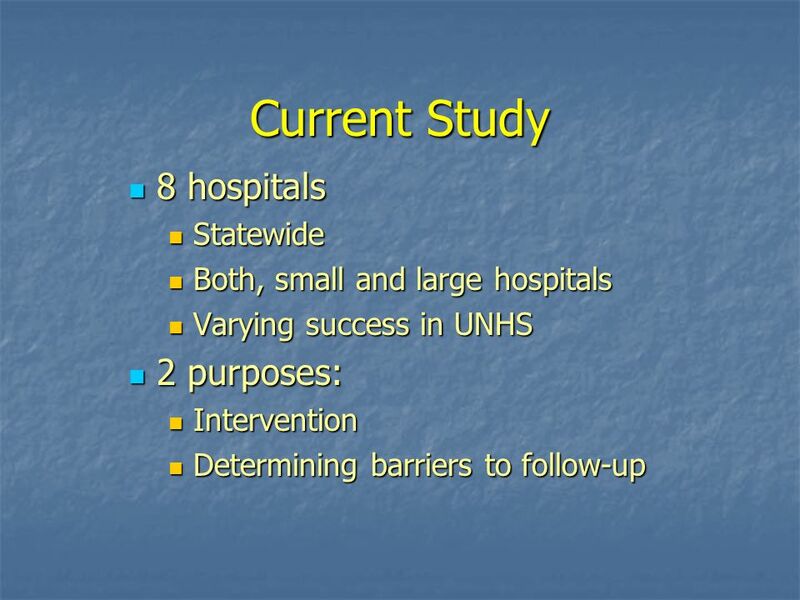 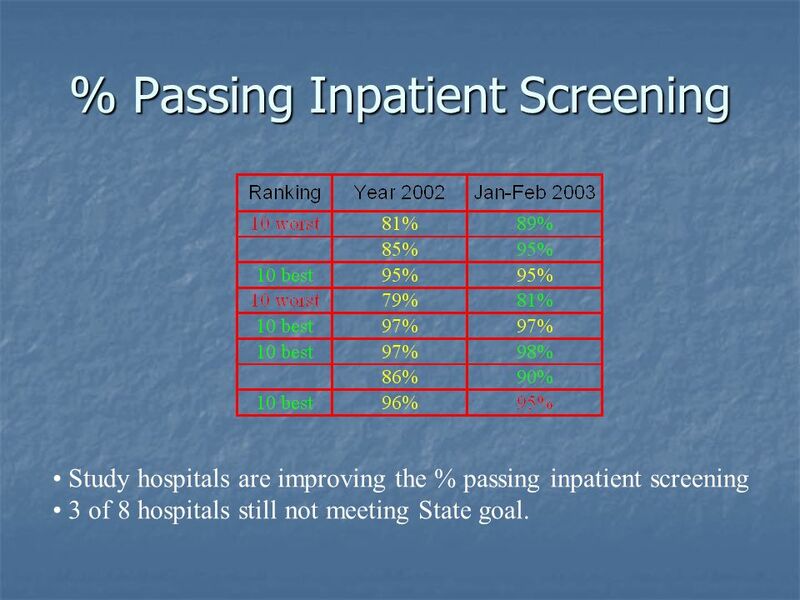 34 % Passing Inpatient Screening Study hospitals are improving the % passing inpatient screening 3 of 8 hospitals still not meeting State goal. 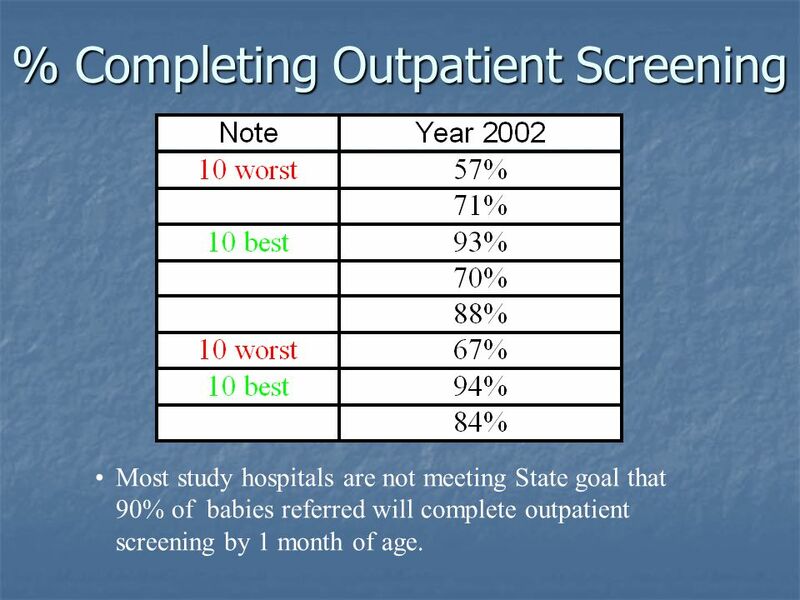 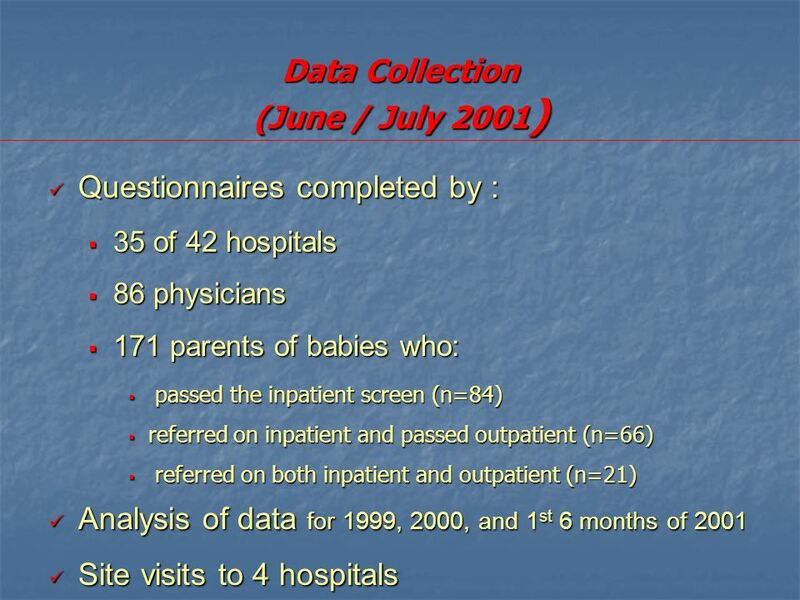 36 % Completing Outpatient Screening Most study hospitals are not meeting State goal that 90% of babies referred will complete outpatient screening by 1 month of age. 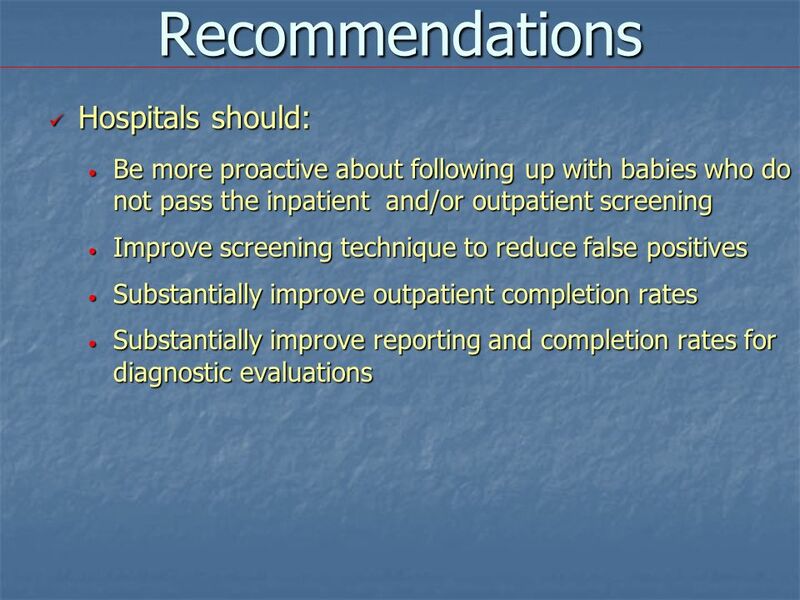 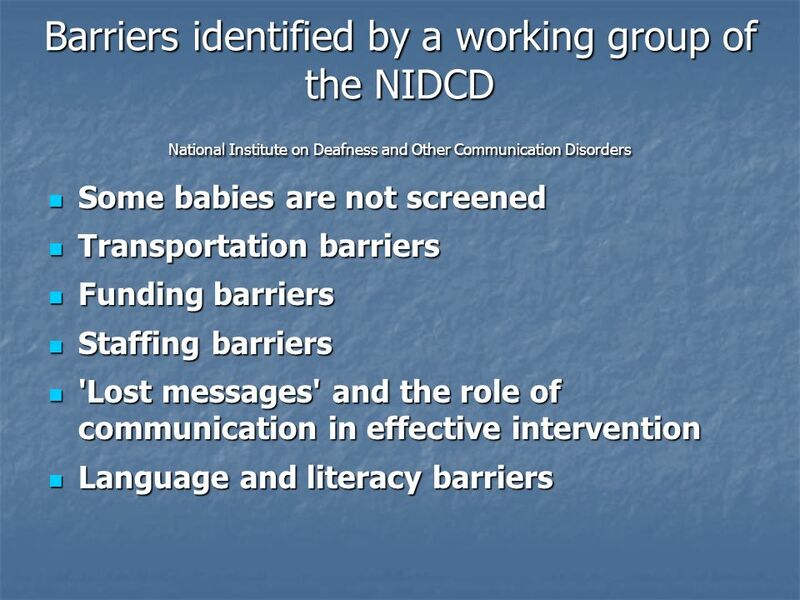 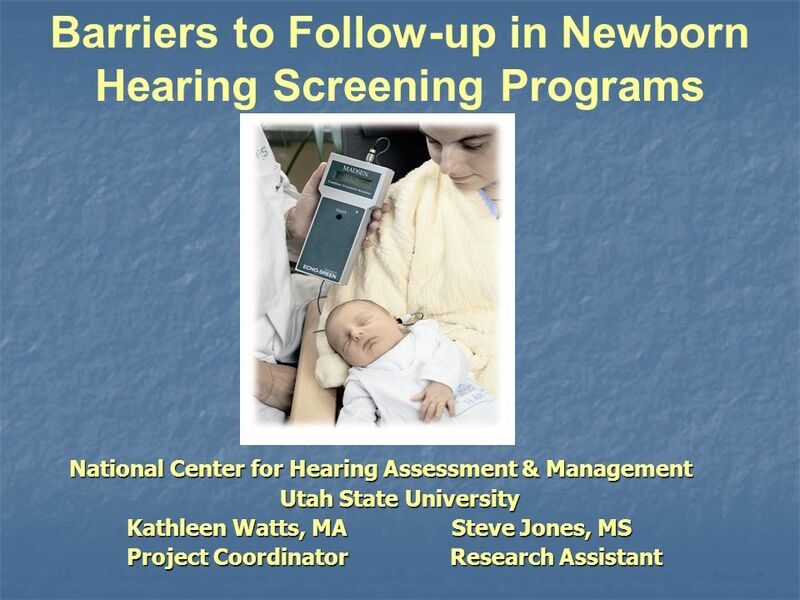 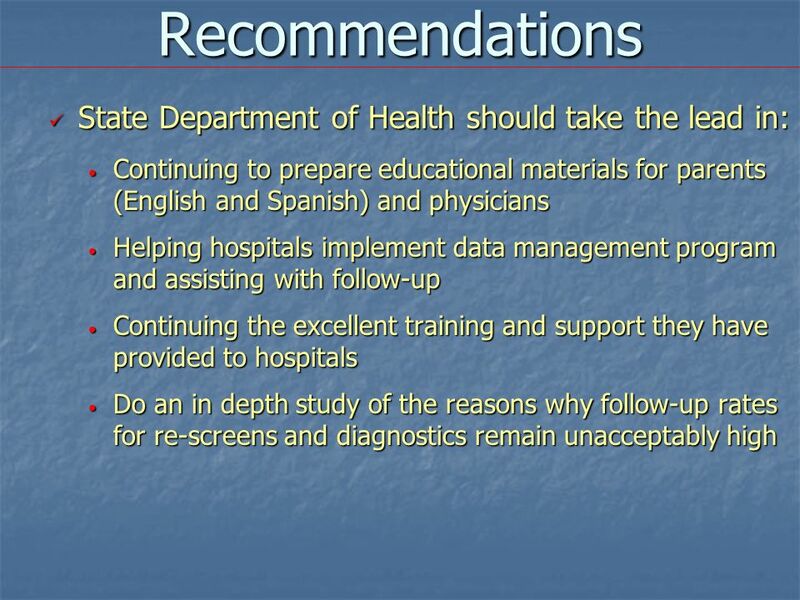 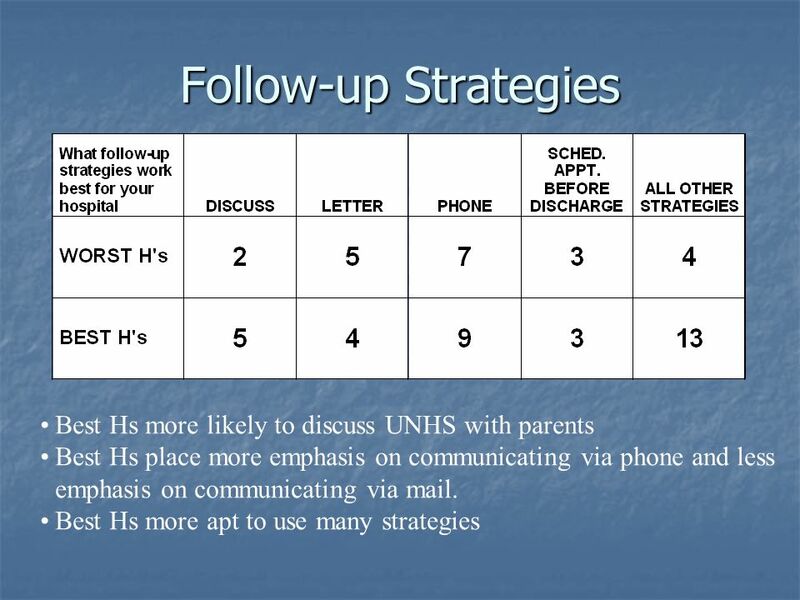 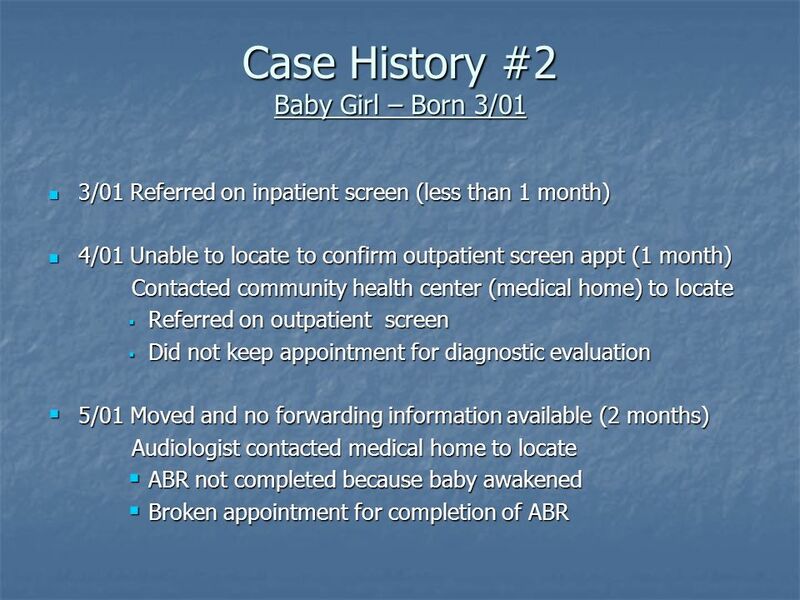 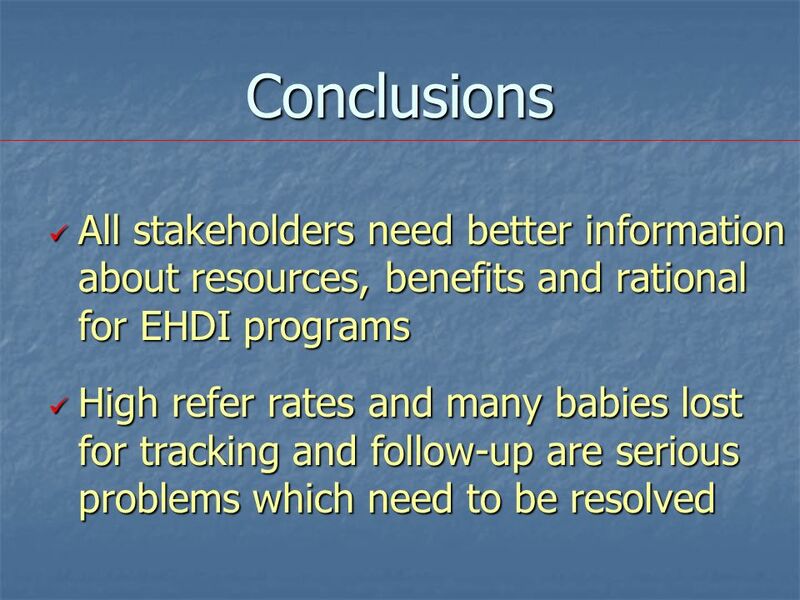 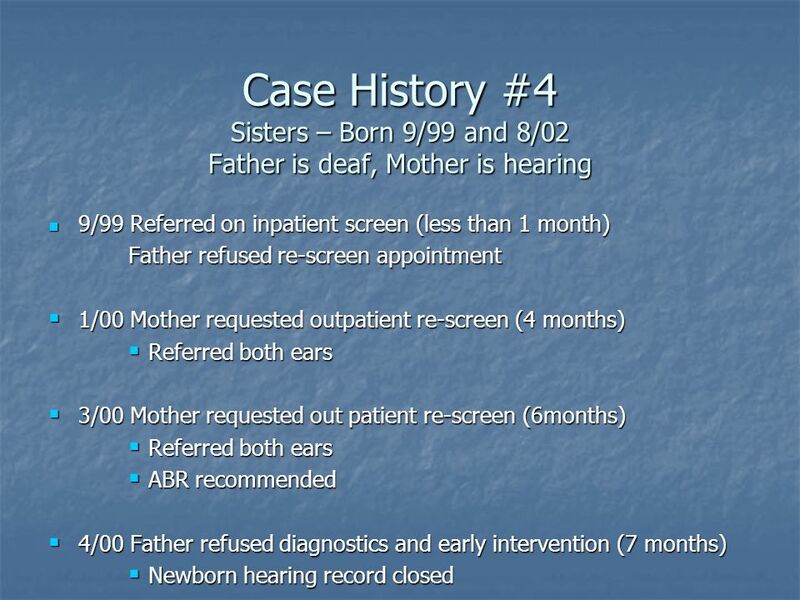 Download ppt "Barriers to Follow-up in Newborn Hearing Screening Programs National Center for Hearing Assessment & Management National Center for Hearing Assessment." 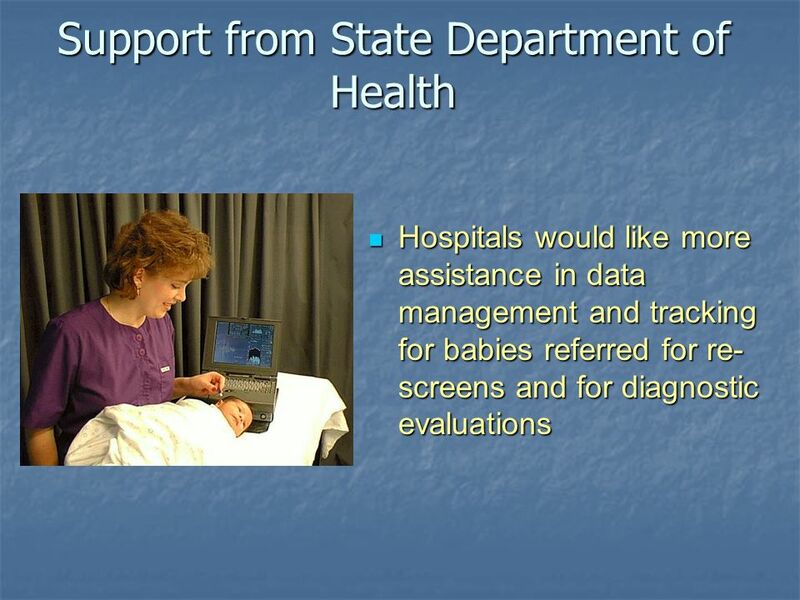 Tracking and Data Management Technical Assistance Workshop for Universal Newborn Hearing Screening and Intervention Margaret Lubke, Ph.D. National Center. 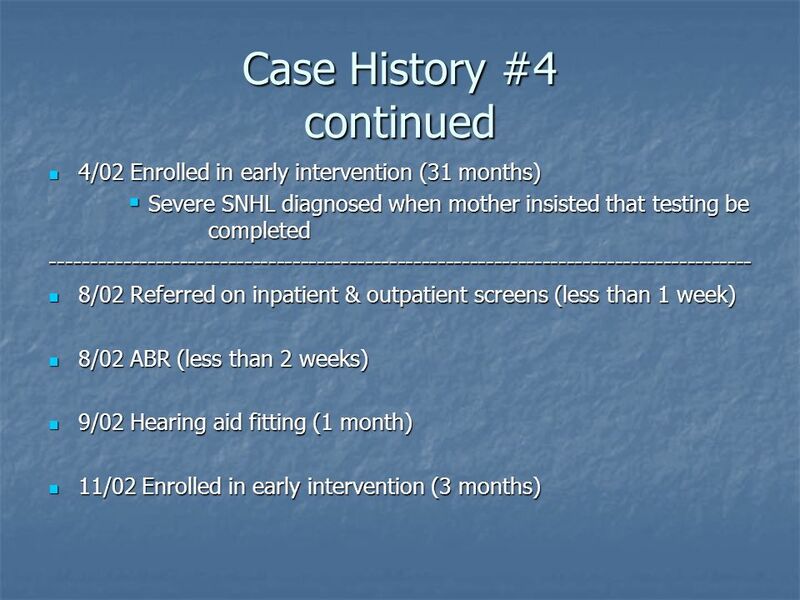 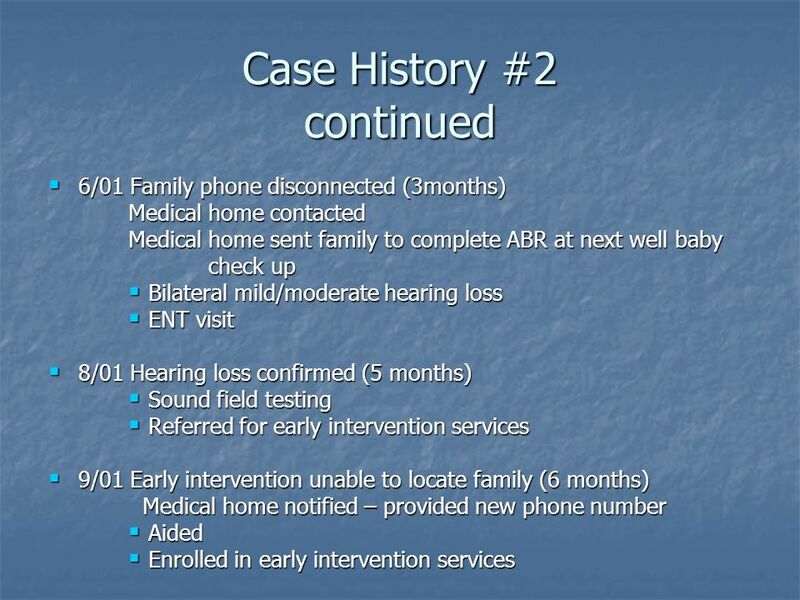 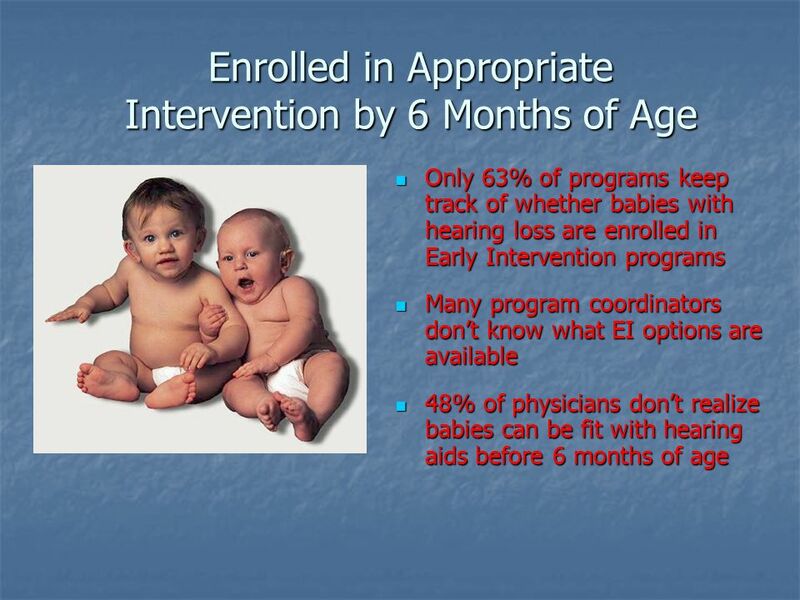 Data and Patient Information Management Systems for Early Hearing Detection and Intervention Programs. 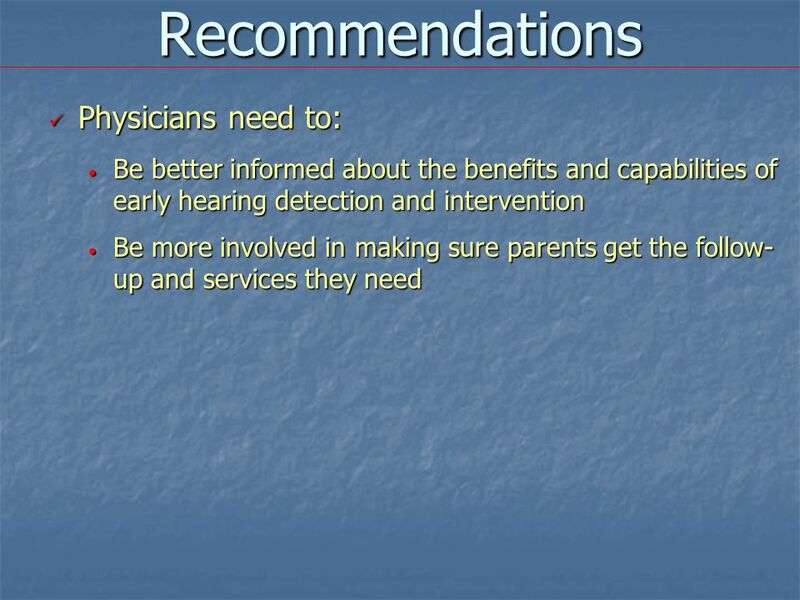 The Physicians Role in the Development of Effective Early Hearing Detection and Intervention Programs.